I wanted to let you know that I am working on a release to keep in harmony with the latest direction. I have completed the slightly new layout, with Placements and Video Showings and have updated the service year at a glance tab. These changes will go retroactive to keep my ministry simple, and easy to follow. Therefore my plan is to release the new build in the first week of January, so that December reports can be processed with Magazines, Books, Brochures & Tracts. I am finalizing my testing to ensure everything works as expected with this large change to how we track and report of monthly service. I am also planning future updates once this one is released around reminding those who have connected to Dropbox, to back up at a regular interval when the app is opened. Hope you are continuing to find My Ministry useful. 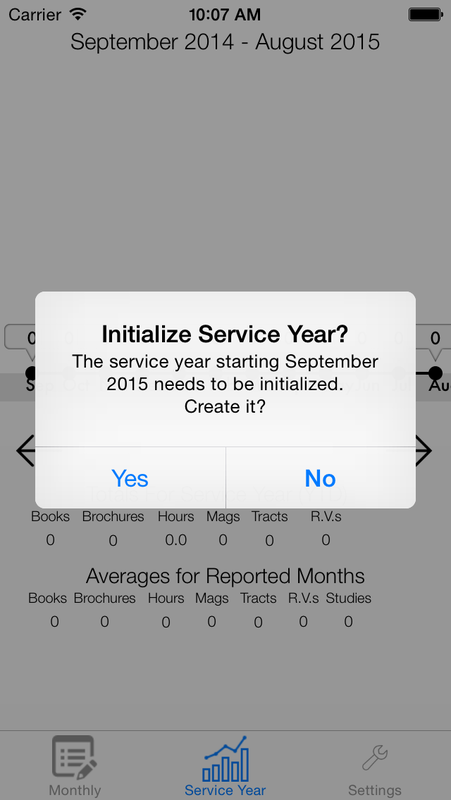 It just requires you to change your service year and flip to the monthly view. By default My Ministry scrolls to the current date for quick entry. When you change service years it starts in September. So you need to scroll to August. Scroll forward not backward since the service year goes from September to August. Here is a quick tutorial on how to do it. Please note: A new release is coming with the labels to make it more intuitive. I have had several questions on what happened to my last service year? The design of My Ministry is to be extremely simple, so that you are able to focus on one thing, entering your time fast and easy. 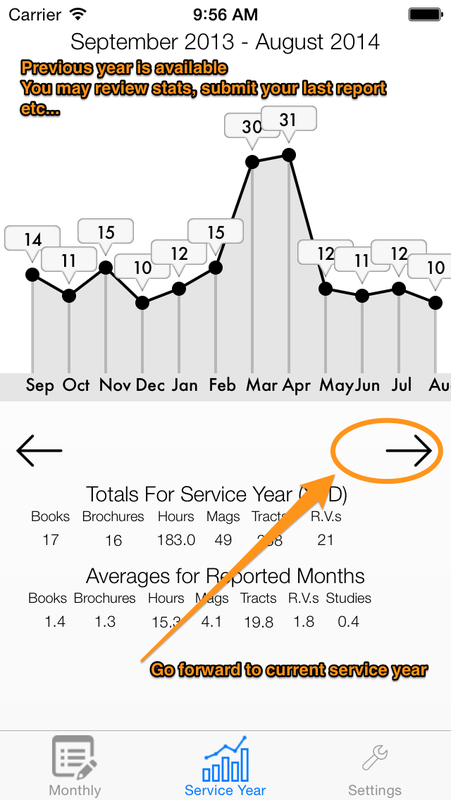 Therefore it shows a single service year at a time, but all your data is still there. When you open My Ministry and navigate to that tab – it may appear that all your data is gone. 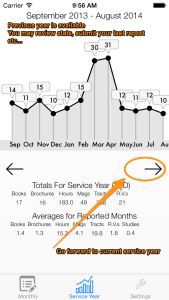 Select the LEFT arrow button to navigate back, and all your information from the previous service year will be present. How should I enter minutes? I have had several people confused with the correct way to enter minutes when using My Ministry. I would like to explain how to do it and why I chose this way. In order to keep My Ministry simple and easy to use, I decided against tracking actual minutes and went with whole and partial hours. This makes tracking time simple and fast. The majority of the publishers I asked tracked at 1/4 hours or 15 minute intervals. Therefore that is how it adds the time. 3/4 of an hour is 45 mintes. So to enter 3/4 of an hour, you need to use that decimal representation of it which is .75. If you want to track at a more granular minute level, then you’d need to figure out what your minutes represents as a portion of an hour. For example 40 minutes would be 2/3 of an hour or approximately .66. I hope this helps explain how to correctly enter time in My Ministry. I recently noticed that my reminders weren’t popping up in iOS . 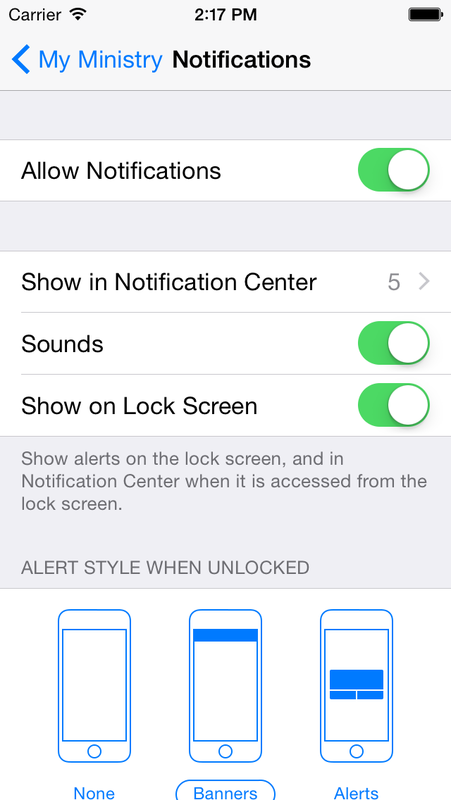 I needed to request permission to sent alerts, so that you can control these items. 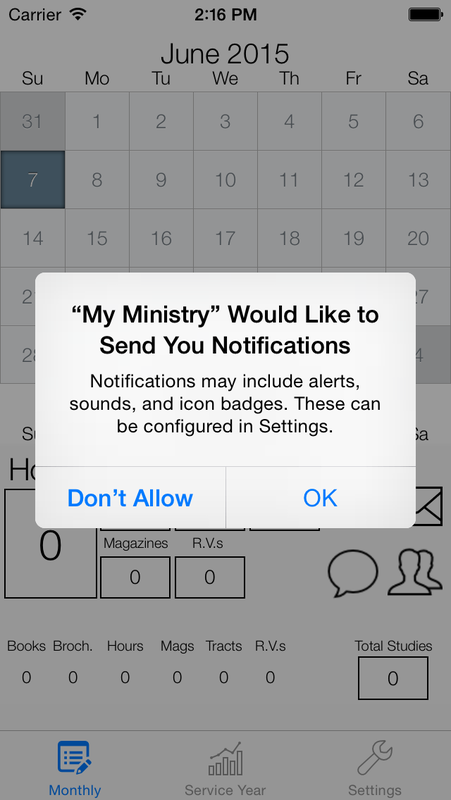 By selecting allow My Ministry will be allowed to prompt you to turn in your time and to send reminders on service plans. If you choose to not allow, and later change your mind, you can update these settings in Setting-Notifications-My Ministry. I hope you continue to find My Ministry useful. Reviews are reset with each update, therefore I would appreciate your continued support with a review if you find the app useful in tracking your Field Ministry. It is my hope that this new build provides you with better functionality and easier time tracking. I appreciate all feedback, and welcome any reviews in the App Store. 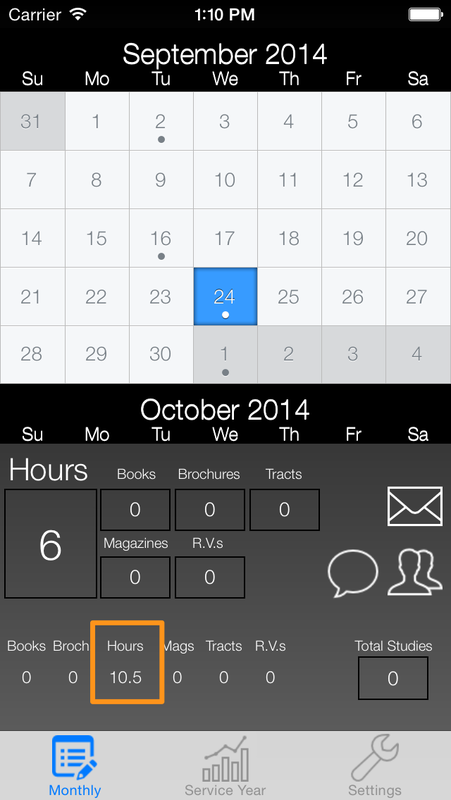 One of the most requested items I have had for My Ministry is to roll over partial hours into the following month. This will be coming in the 1.3.0 update – which is currently in beta testing. 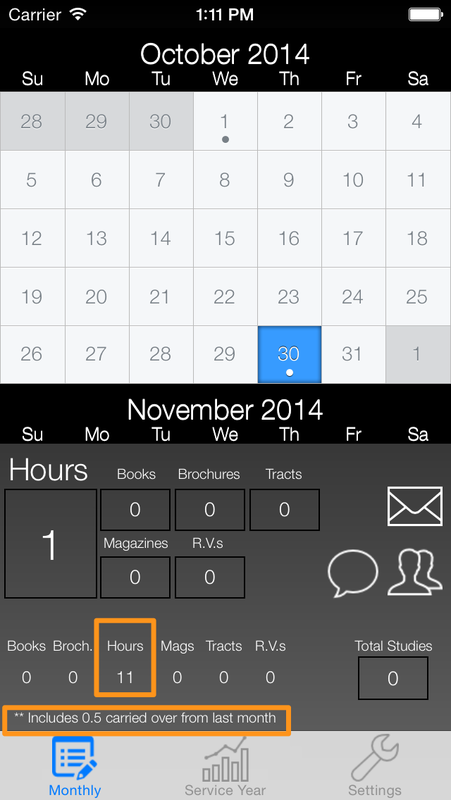 Basically anytime the total hours is over 1 hour any partial hours will roll over into the following month’s report. It will not change the number of hours recorded for the month when looking at the graphs. The report mailed to the Group Overseer will be 10 hours for September, but 11 for October. Where did my last service year go? That’s it! Now you can see all your data form the previous year. 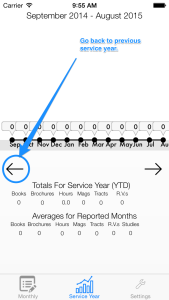 If you need to report August, simply scroll to the month of August and select a date in August and you will be able to report it. 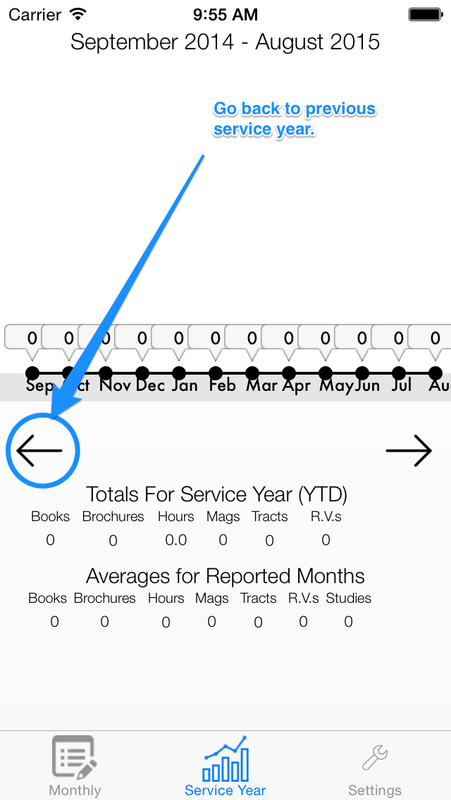 If you click on the arrow and the service year hasn’t been created yet you will be prompted to create the shell to hold the data. You can select yes or no – pressing yes will create it, no will keep you on the service year you are currently looking at. Hope you found this post helpful. Please note, when you close My Ministry and reopen it, it always selects todays date for quick data entry. If you find My Ministry helpful, please leave a review in the app store. purringpigeon on What if I am a pioneer?